What are the differences in memory foam mattress thicknesses? Well Known Manufacturer And/Or Good Customer Reviews? Mattress thickness is an important consideration when selecting a memory foam mattress. You may be wondering if there is much difference between an 8 and a 10 inch mattress, or some other pair of options. The answer is yes there is. Let’s look at the factors that determine the difference between an 8 inch mattress and a 10 inch mattress, a 12 inch mattress, or 14 inch mattress, and how that affects you. 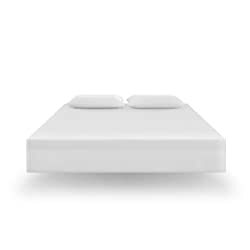 Full XL 53" x 80"
When it comes to memory foam mattress there is a minimum mattress thickness at which a mattress offers a good performance. Go too low and you risk getting a mattress that is anywhere from uncomfortable to having a very short lifespan before it collapses. There are 8 inch and even 6 inch memory foam mattresses on sale. We recommend you avoid them. 8 inch memory foam mattresses and below tend to be too thin to provide an adequate level of comfort and support for the average person. And even if they could do that, they would likely not last long before breaking down. The structure of 8 inch mattresses or less simply isn’t good enough. Mattresses are typically composed of a memory foam layer and one or two other foam layers. The right balance is best achieved with a mattress of 10 inches and above. You can regard the recommended standard mattress thickness for memory foam mattresses as 10 and 12 inch. Memory Foam Mattress And Body Weight? How much you weigh is an important factor in choosing a mattress. We have already discussed that an 8 inch memory foam mattress or less isn’t really adequate for the average body. Similarly on the opposite end, the more you weigh, the thicker you’ll want the mattress to be. 10 inches is adequate for most people up to 250lbs, but if you tend to be a bit on the heavier side or want the extra thickness then you may prefer a 12 inch. And if you are particularly large and heavy, a 14 inch would be better. However, do also consider that the thicker the mattress is, the higher it’ll be to climb into bed. When it comes to considering the difference between an 8 inch, 10 inch, 12 inch, or 14 inch mattress, you will probably want to filter out anything less than 10 inches, and then base your decision on your personal desire for comfort and your weight. Some manufacturers try to pull the wool over people’s eyes with the 8 inch memory foam mattress. It really is a bit below par for the average adult person. It might be adequate for a teenager, child or a very skinny and lightweight person, but it is less than adequate for supporting the weight of an average person. A memory foam mattress incorporates at least 2 different foam layers. An 8 inch mattress does not allow for an ample amount of foam layer material to produce a mattress adequate for most people. We do not recommend that you go for anything less than a 10 inch mattress. If you’re wondering what memory foam mattress thickness is best, 10 to 12 inch is the sweet spot. For the average person up to 250lbs in weight, a 10 inch mattress will suffice. If you or your partner are over 250lbs, or if you feel you would appreciate the extra thickness then go for a 12 inch. A 10 inch memory foam mattress provides the necessary amount of memory foam required for a comfortable night’s sleep for most people. This is why it is the most popular size, alongside the 12 inch for those that prefer extra thickness. Memory foam mattresses are made of typically 2 or 3 foam layers. One layer is the memory foam material itself. The other layer or layers are supporting foam. The difference between a 10 and 12 inch mattress for most people will be about the feel of the level of thickness or firmness. A like for like 12 inch mattress is going to have more of a floating feeling than a 10 inch because of the extra foam. For someone over 250lbs in weight, they might prefer to go for a 12 inch mattress by default. While mattresses typically jump up 2 inch steps, 13 inch mattresses can often be found too. We regard them the same as considering a 12 inch mattress rather than a 14 inch for comparative purposes, and for consideration against 10″ mattresses. If you were also looking for some quick recommendations, here are 4 excellent choices. Going higher than 12 inch (or 13 inch) to 14 inch or 16 inch is mainly for heavier people. It is also for those that have a strong preference for really thick mattresses. It might be slightly less comfortable than a 10 or 12 inch for everyone else. If you want to go for one of these be sure to account for both the height of the mattress and the height of the memory foam mattress foundation. Combine the height of the foundation with the height of the mattress and visualize getting into the bed. This will help you anticipate whether you’ll have difficulty getting into a bed that’s high, thanks to having such a thick mattress on it. Of course there’s more to choosing a mattress than considering its thickness. The internal construction of the mattress is also something to consider. The construction of a memory foam mattress usually consists of having a series of 2 or 3 layers of different types of foam. The density and thickness of each of these layers can also vary. So you can have two 10 inch mattresses, yet the experience laying on each will be completely different because of these variations. 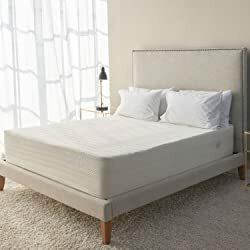 However, speaking just in terms of mattress thickness, if all things are equal apart from the mattress thickness, then a 10 or 12 inch mattress is fine for most people. Heavy people may wish to go for a 14 – 16 inch mattress. Not all foam and not all manufacturers are of the same quality and standards. But we’ve saved you the time of having to do intensive research, scroll up for some great 10-13 inch mattress options. You may be wondering what is memory foam mattress density. The density of the mattress is another thing to consider. Memory foam density is a loose informal measurement of the quality of the mattress. You will need to look for a mattress that ideally has between four to six pounds density. This is recognized as the optimum density range. Densities below 4lbs may be too soft. Densities above 6lbs may be too firm. Something else to consider of course the manufacturer. It helps to provide reassurance if the manufacturer is well-known? That said, manufacturer reputation does not necessarily carry the clout that it once did. New players have entered the mattress market and disrupted the big brands control of the market. They have achieved this by introducing quality mattresses at much more affordable prices. Such upstarts include Tuft N Needle and Leesa. Customer reviews more than speak for the quality and value of these mattresses. A point worth mentioning with the higher thickness mattresses in particular is that you will want to consider the combined height of your mattress and mattress foundation / base, especially if you have difficulty getting into bed. Fortunately, there are low profile foundations available which are lower in height than standard foundations if bed height is an issue. Mattress thickness is an important consideration. 8 inches or less is best avoided, as these do not tend to provide an adequate level of support and comfort. 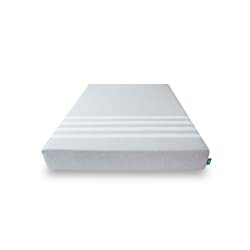 A lot of the quality mattresses on the market from reputable manufacturers and quality upstarts will be 10-12 inches. And of course you do not want the mattress to quickly thin out. So it makes sense to avoid the thinnest mattress in the range. So for most people, a 10 inch mattress will be a good thickness size for them. A 12 inch mattress will be for people that generally prefer a greater level of thickness and sturdiness in their mattress. It is also good for people that tend to weigh a little bit more than the average person. This is the obvious reason that a thicker mattress, can better support the additional weight. And itself follows then that a 14 inch mattress will follow the same principle. That is people that prefer an extra thick mattress will want a 14 inch mattress. Or people that are very heavy will prefer to have a 14 inch mattress. So the main issue to consider before you entertain looking at mattress thicknesses, is to first filter out the mattress brands that are unknown. Or those have no evidence of customer appreciation. And then you should check that the density of the mattress falls between five and six pounds. This is to ensure that the mattress is both not too firm, yet not too weak either. Now that you know the importance of mattress thickness and other things to consider, you are well informed to buy a great mattress. If you would like some recommendations to consider, check out these highly rated mattresses below.